We are all getting very competitive over the scarecrow competition that will take place at the Shamley Green Village fete on Saturday 11th June. Ours has been made and is hidden at a secret location along with his wife. The fete will open at 1pm on the village green and will also feature the annual dog show, which has nine categories ranging from Cutest Puppy to Best Sausage Catcher. There will be plenty on offer for everyone including a hog roast, beer tent, pony rides, bouncy castle, an art and photography competition, garden stalls and plenty of side shows. You will find Shamley Green on the B2128 heading from Guildford towards Cranleigh. Parking is available in the fields between The Red Lion and Bricklayers Arms, both of which will be open for lunch. 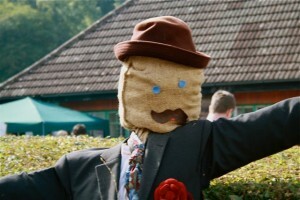 Don't forget to bring your scarecrow...but be warned the standard is high! UPDATE: The competition was fierce, but we won third prize.